Recently I’ve been tracking the growth of social analytics and the means of delivering well on it. Connecting analytics to the needs of the business is the next step beyond basics of collating, aggregating, and identifying patterns in what the world is doing that affects your organization. On ZDNet recently, I explored the rapidly growing trend of big data. Collectively, big data represents a set of highly innovative new ways that companies are developing to distill value from the sheer scale, richness, and complexity of today’s vast networks of people and their data, of which the Internet is just the biggest example. It is social media in particular, however, where big data and business value intersect. Technology of any kind isn’t very useful to us unless it’s put to work. This is where one of the most interesting new parts of the social media landscape has been forming, namely in the new field of social business intelligence. This is the discipline of monitoring the whole of the social media world while continuously deriving insight from the aspects of it that matter to you, strategically or tactically, depending on your needs. I say aspects instead of conversations, because while analytics will give us useful metrics, it’s only until we apply the lens of business intelligence to the data itself can we clearly see the deeper and larger scale implications for our businesses. 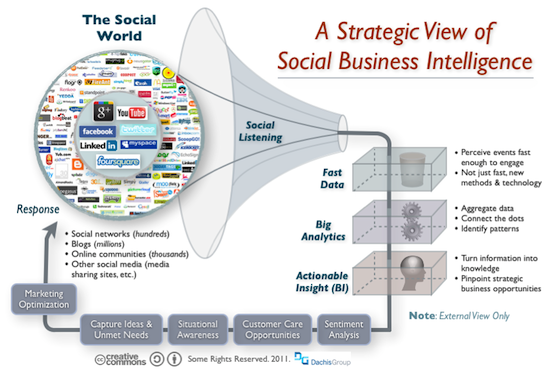 That’s not to say that there isn’t a lot of blur between social analytics and social business intelligence. They’re both relatively nascent fields that have plenty of overlap. So where social analytics is about the measurement and data mining of the social universe for any reason, social business intelligence is concerned with a more holistic process aimed at specific business outcomes, depicted conceptually in the visual below. To be sure, there are many different flavors of social business intelligence just as there are many reasons why organizations will want to create business processes around the feedback loop that forms. Currently, many of the processes involved are manual and ad hoc as the industry has felt its way forward and learned how to engage more meaningfully with social media. A few companies on the leading edge have increasingly formal social business intelligence processes based on sets of capabilities they’ve acquired or built. Other firms have hardly any technology at all, other than perhaps some reports and spreadsheets. They are all seeking the same thing however: To pinpoint the opportunities and identify the events that matter most to them so they can engage. The actual response to social business intelligence insights will vary entirely based on what is learned. It can be strategic and affect how the companies evolves its products and services or the way it engages in entirely new and innovative ways with customers. Or just as likely, it’s on-the-ground insight that drives individual interaction or collaboration with prospects, customers, business partners, and others whose current and past activities social media have been identified as important. Developing your social business intelligence capability will be a journey that will have stages, like any other process of development. For most organizations, it’s just a set of experiments at the moment. But over time, with hard-won lessons learned, it will become more formal and institutionalized. Usually too soon, the question of centralization will come up, since it’s often one of the experiments in a particular corner of the organization or another that will have significant success. It almost certainly will be asked if it makes sense to share this best practice and locate it in the social business unit or other centralized social media management capability. For now, encouraging decentralized experimentation is more important than achieved the economies of scale, since local successes are rarely likely to meet the whole organization’s needs. What’s most important is making as many discoveries as possible about what works and what doesn’t. Right now we are tracking a rapidly growing and expanding set of providers of social business intelligence. Products like Radian6, Kontagent, and SAS Social Media Analytics are just three examples out of many of social analytics tools that also provide some level of deeper social business intelligence features. Over the next few years, there will be numerous entrants into this space, as well as additions to existing social media services, as the industry as a whole learns the ways that companies can turn their social engagement with the world into real opportunity and value. Marketing Optimization. Marketing has long been an early adopter of social media, and it’s no different with social business intelligence. Now instead of reports and dashboards that merely show the what, marketers can find out the why. With social business intelligence, companies can craft much more detailed yet fully integrated qualitative pictures of the inbound funnel, identify why engagement strategies are working or not, and organize systematic, yet mass-customized responses in scale. Capturing Ideas and Unmet Needs. Going beyond the trend analysis of analytics allows the processing and isolation of the deeper implications of social media activity. Social business intelligence can capture innovation, new ideas from the marketplace, identify customer wants and desires, and identify the gaps in your organization’s services. Situational Awareness. Identifying and tracking the top trends, understanding when critical situations arise to protect customer experience or brand, and much more. Going well beyond low-level analytics, social business intelligence can help make sense of more data than any manual or raw analytic process ever could. Customer Care Opportunities. Fully empowering Social CRM, social business intelligence can augment the interaction with customers in social media by improving the triage, prioritization, and resolution process of customer care. Sentiment Analysis. While social analytics can provide some basic insight into a customer’s state of mind, only more sophisticated methods can semantically process and assess the actual meaning of the social media conversations involving your company or its products in order to derive actionable insight. As I pointed out recently, the focus of your social business intelligence efforts will be rooted deeply in business-specific motivations, thus these are just a small sample of the ways organizations will employ the capability. To give you a better sense of the possibilities I will explore specific examples of companies employing the strategies above successfully in upcoming posts. What does all this mean for you now? In my opinion, it’s virtually certain at this point that social business intelligence will become a vital component of the way that companies derive bottom-line benefits from social media including revenue growth, innovation, cost reduction, and more successful line-of-business operations. So connect to the world, start your experiments, and start learning how to make it work for you. Gartner forecasts business intelligence as a whole to grow from $9 billion to $14 billion by 2014. Any smart BI vendor will move to integrate social data in to their software, as this is the hot trend. Social business intelligence is not just a passing trend; it gives companies a huge competitive advantage in nearly all markets. By leveraging social media and correlating social data with key business metrics, companies can better understand their customers, find trends to lead the conversation, and fix small issues before they become big problems. More importantly, executives can understand how social data directly affects revenue growth and profits. Thanks for the post, Dion. It’s excellent to see someone is writing so adamantly for social business intelligence, an industry that is sure to grow exponentially in the coming years. Great article Dion. I liked it so much that I decided to blog about it and expand my thoughts around it. It was so much in line with what our large enterprise wide clients are asking us. Let me know what you think when you get a chance. Thanks and looking forward to your feature posts.